in a very giant cooking pan, cook bacon over medium heat till crisp, stirring often. take away with a slotted spoon; drain on paper towels. Discard drippings, reserving 1-1/2 teaspoons in pan. Add onion to drippings; cook and stir over medium-high heat till tender. Meanwhile, place potatoes in a very giant saucepan; add water to hide. bring back a boil high heat. cut back heat to medium; cook, uncovered, 10-15 minutes or till tender. Drain, reserving one cup potato water. Add corn, milk, salt, pepper and reserved potato water to saucepan; heat through. Stir in bacon and onion. 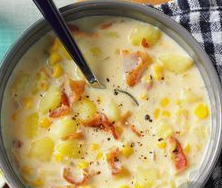 0 Response to "Bacon-Potato Corn Chowder"